You’d be surprised the conversations you get involved in at church. The teens are talking about the “Ponzi scheme” of social security, while one sister is talking about how knitting can “tighten your bosom” if you do it enough (knitting, that is), another is recommending Robitussin for infertility (really?? ), and two others are talking about how much they love their homemade deodorant while you’re trying to ignore the bloody photos & details of a hunting trip some of your brothers just returned from. I love my brothers and sisters in Christ for all their diversity! And thanks to two of them, I found out how to make my own deodorant and so will you. Many are concerned about the aluminum found in store-bought deodorants, afraid that daily use will raise the aluminum levels in our bodies above what is healthy. The reason deodorants contain aluminum is to actually prevent perspiration, which is the only down-side to making your own deodorant. If you’re hot enough to sweat, you will still sweat. But at least you won’t smell! And sweating is actually a very healthy thing, allowing your body to release chemicals and toxins through your pores. Like I mentioned in one of my Thankful Thursday posts, this homemade deodorant passed the ultimate test for me: teaching Sunday school. I’m not a very stinky or sweaty person even without deodorant, and with it I’m always fresh as a daisy, except on the Sunday mornings that I’m teaching Sunday school. It’s ridiculous, but I’m totally intimidated by children when I’m supposed to be in a position of authority. I love playing with kids, having fun with them, but when I’m supposed to be their superior and not their colleague, hoping that I sound like I know what I’m talking about, and required to discipline them if necessary, I almost can’t handle it. (One big reason it might be a blessing that I’m not a mother!) Before the homemade deodorant, I always stunk to high heaven after teaching Sunday school, but when I went in wearing the homemade stuff, I came out smelling just as shower-fresh as before! So, it definitely is an effective deodorant. As for the look and feel of it, it does not compare to the invisible types, but depending on how thick you make it, can actually be less visible than traditional stick-deodorants. The first batch I made quite thick, only adding enough coconut oil to make the consistency like a thick, whipped frosting, and it went on a little thick when applied. The second batch I made thinner so that I could actually pour it into the deodorant tube (the first batch I scooped and smashed into it), and while I have to keep it in the fridge so that it stays solid, it goes on very thin and smooth so I like it better that way. I find I only need a very light smear of it, which means it lasts much longer than regular deodorant. This may differ from person to person, and your mileage may vary. While reading other reviews of this type of deodorant, I found that extra virgin coconut oil is ideal, as it is antifungal and antibacterial, which boosts the odor-eliminating power of the deodorant. I also discovered that some people are sensitive to baking soda and can get a rash from it, so you may have to tinker with the recipe to reduce it (and upping the cornstarch as you do) until you get a formula that your body likes. If your skin starts to get dark under your arms and starts to itch, this is a skin yeast infection which one person said is caused by the baking soda (I tend to think it would be the cornstarch since it is something that yeast could feed off of, but I don’t know). If this happens to you, get a generic athlete’s foot cream to clear it up. I have had this happen before for a different reason, and found that Lotrimin (I got generic) worked best for me, clearing it up in just a few days. Go back to your regular deodorant until it’s cleared up, then tinker with your recipe to adapt it until it no longer has this effect. You could even try putting Lotrimin in the mixture. Start with an empty deodorant tube. 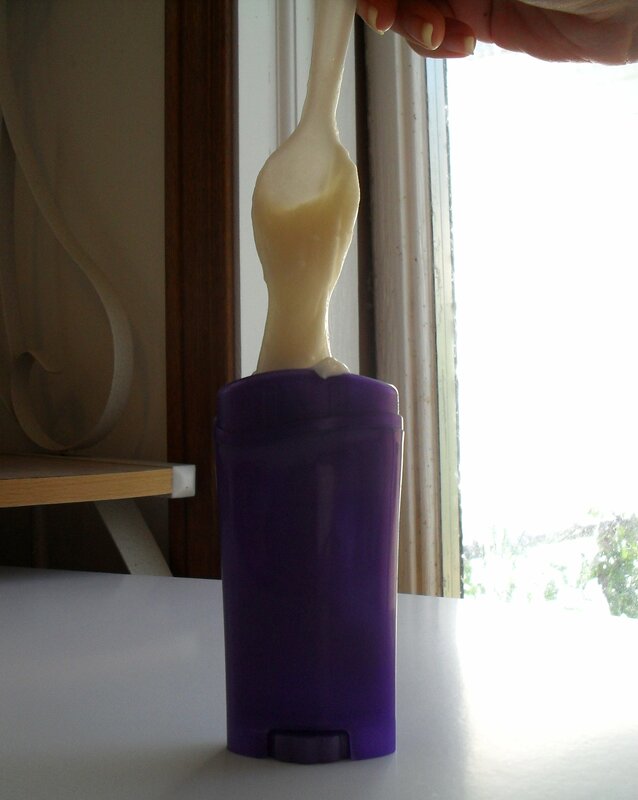 If yours still has deodorant in it, just roll it up and pull it off the base. Reusing the container and wasting the deodorant is cheaper than buying a brand new empty container by itself, because you don’t have to pay for shipping. Be sure to wind the base down to the bottom before filling. Whisk the baking soda and arrow root powder or cornstarch together in a bowl until lump-free and fine. and stir with a spoon until incorporated, then whisk it up until smooth. Add your essential oil(s) in now to reach your desired fragrance, then add additional coconut oil or dry ingredients of equal measure as necessary to achieve your desired consistency. 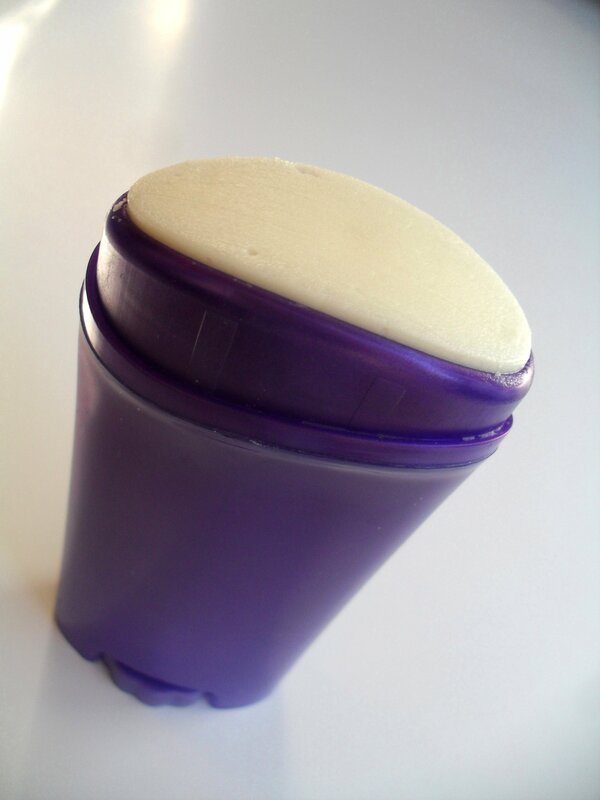 Pour or pack into an empty deodorant tube and refrigerate until solid. This may be stored at room temperature, but if you made the mixture very thin, you will have to keep it in the refrigerator if you want to apply it as a solid rather than a cream. 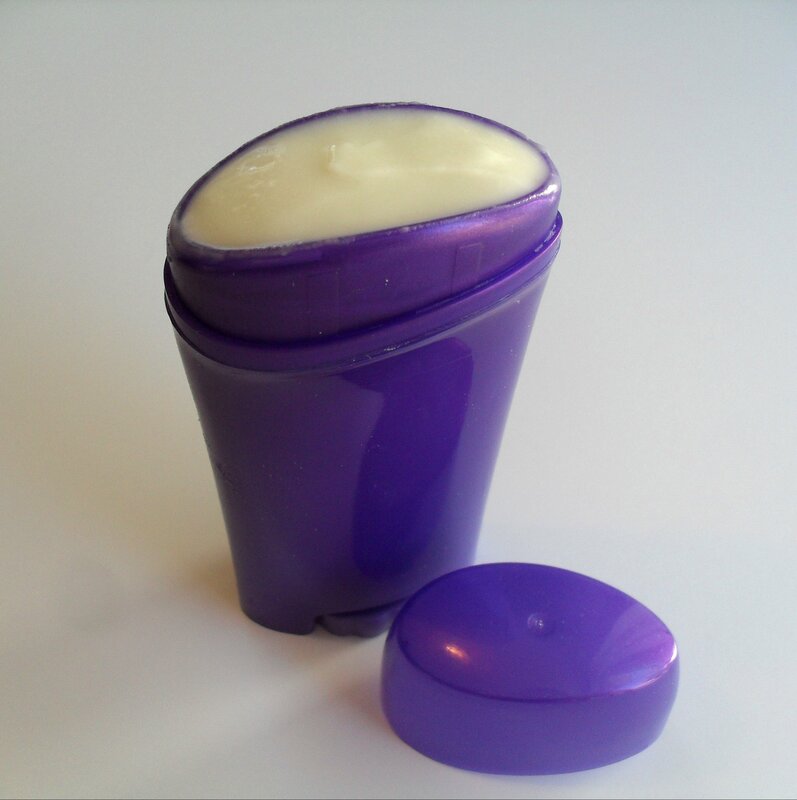 Posted in How-To & DIY and tagged aluminum-free, deodorant, easy, fast, homemade, recipe. Bookmark the permalink. 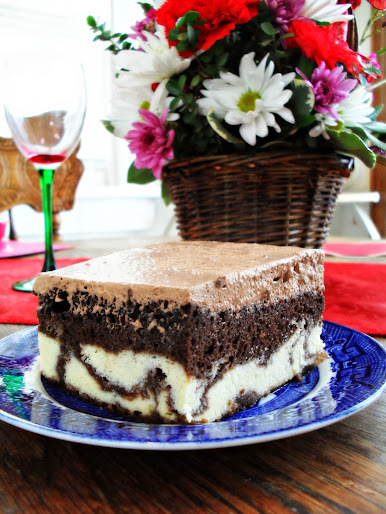 Veronica, I will have to make me a batch sometime and let you know how I like it! I love to read all the things you do, you are a busy Girrrlll!! wow, I didn´t expect this to be so simple!! Thank you for sharing. I can’t wait to try this. Awesome!! I’m also surprised at how easy this is to do. Thanks for the tutorial! That’s really cool. We’ve got a daughter that’s all hippie, and she’d love this! How amazing is baking soda…it’s seriously the most useful and cheap product ever. I’m actually one of those blessed Asians who never use deodorant because I rarely sweat, though. “your mileage may vary” – hysterical. Hmmm I’ll definitely try this after my next tube of deodorant runs out! I don’t sweat much in general unless I go to the gym…but when I do…deodorant is KEY. I tried tis recipe recently.but the end result is not as desired. The deo’s texture is a little ‘grainy’..as in the baking soda did not completely melt in the oil.I expected it to b creamy but it’s not. I think your readers should be aware that coconut oil can cause contact dermatitis. I found this out the hard way. It took a while to find the cause of a bad under arm rash. I knew it was the deodorant but it took a while to find out why. I discovered in a soap making book that this is the effect of coconut oil on some people. Now I have to find a substitute for the oil. Maybe just use the baking soda on its own might be a solution. Thank you so much for this helpful information! I think the baking soda does work on it’s on, just harder to apply and can be harsh when you apply it straight. Maybe using a powder brush (like a big makeup brush) would help put just a bit on. You might try using Shae Butter. I’ve seen it in other recipes. Yes, Robitussin for infertility. If you tend to be (ahem) a little dry, try a dose of Robitussin about an hour before “trying”. It is an expectorant, and will loosen fluids necessary to get certain lil critters to the other important critter. Worked for me twice!!! Blessings!